The Garden benefits greatly from the efforts of many dedicated volunteers. The volunteers play a variety of important roles, including providing Garden tours, maintaining the Garden and supporting and learning activities. 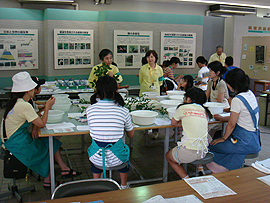 A lot of photographs and materials of plants are supplied by volunteers for exhibitions and learning activities. 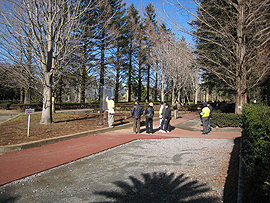 Volunteers are the guiding force behind the Garden's most popular activities. The Garden's volunteers are easily recognizable by their yellow shirts and blue vests. On Saturdays and Sundays, the volunteers provide guided tours, featuring plants and gardens of special interest in each season. In addition to scheduled tours from 1:30 PM, the volunteers are pleased to offer specially tailored tours according to request. If interested, please feel free to ask any of the volunteers in the Orientation Building. Volunteers lend a helping hand for maintenance of the Garden. Volunteers assist at all kinds of events and learning activities at the Garden. They also take part in hosting the Summer Holiday Festa, a planned exhibition, and other interactive events.